Just a short note to you all. I went in today for news of the scan and for treatment. It was sort of a good news/bad news deal. The scan was good showing a 10% shrinkage in the tumors. But the two month effort has left me too beatup to get treatment. So Nugget sent me home to recoup for one cycle. Try to gain a few pounds back. Some I am home at the ranch. Will be making it out to the airport to pick up My Rebecca this evening. So, that’s the situation. Catch you tomorrow. Please pray for me. Love, Felipe. Off to the big city with Catherine in a while to get a scan to see how my lungs are doing. Two months of treatments accomplished and now to see what is happening. Thanks for all your thoughts and prayers. Wiley and I were out pruning our plum tree yesterday. I worked for half an hour before I ran out of steam but it was a gorgeous day and I couldn’t resist trying. 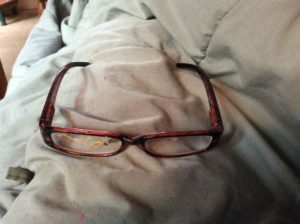 It is right along where we walk the trail and Wiley found this brand new pair of reading glasses in the grass. They are 2.50 strength with brown frames. Who knows how long they have been out there. Are they yours? Time for a shower and shave. Hope everything is well with you. Love, Felipe. Monday morning and have an precious hour to be with you. I am going to walk at 0900. Blue sky out there right now overhead. Well, we lost Rho. Well, we didn’t really but she isn’t physically present this morning. Ah, she will be missed. Like all our guests she left certain jewels and hopefully she took some with her from here. By jewels I mean inspirations or methods that we can now employ. One lovely practice that she played with was picking up three things from the environment and making little collages. Then rearranging and maybe rearranging once again. 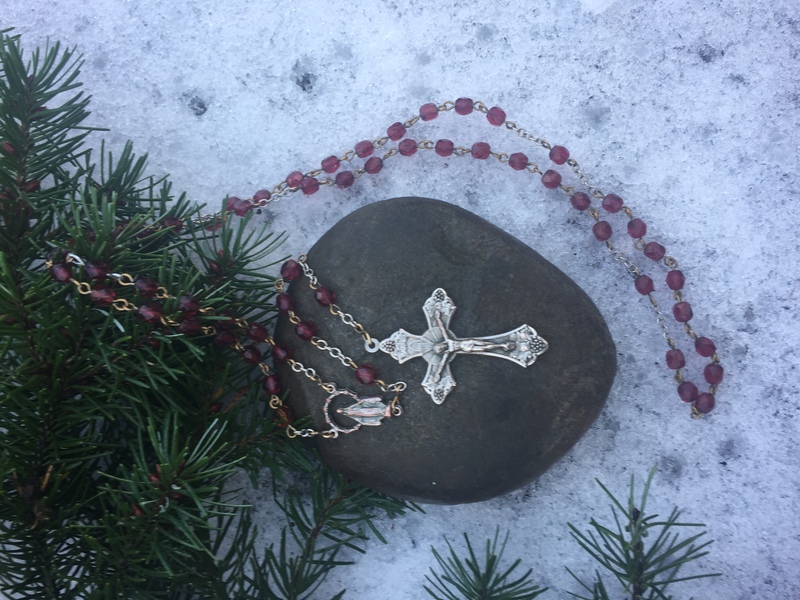 The pics of my rosary with various other items were her works. 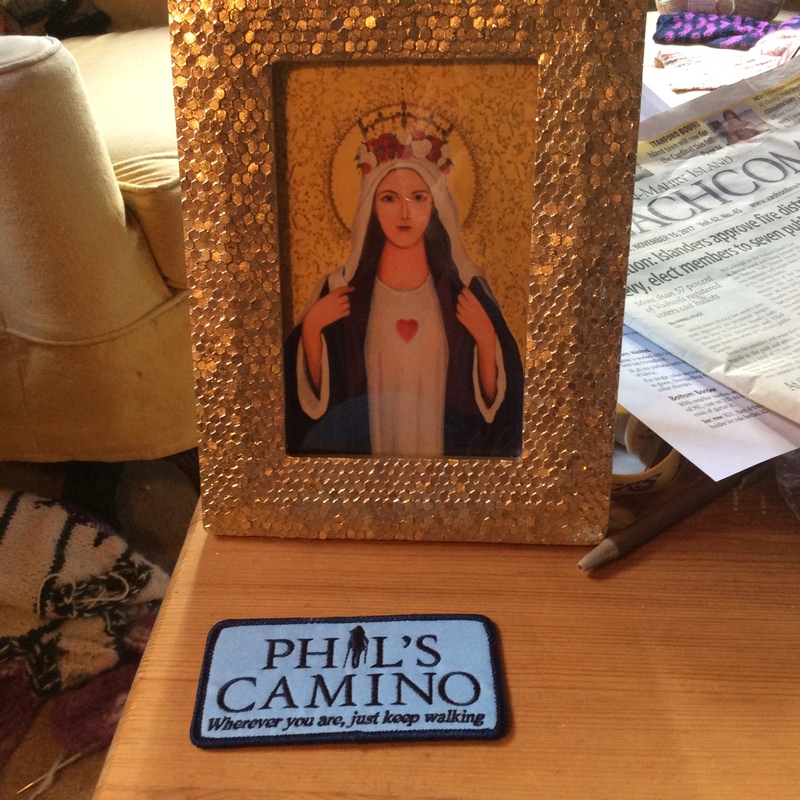 I walked only one lap on Phil’s Camino with her and then I had bad symptoms and couldn’t continue. 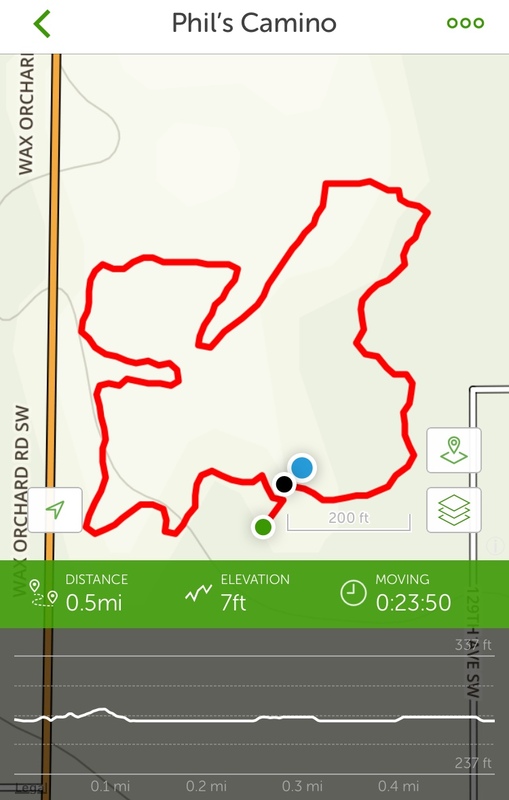 But when I said that she could walk alone and it would count in the logbook she just took off and did seventeen more laps in the next few days. Yea, enthusiastic! We had some time to talk about archery and we got one archery session in. We will have to continue later as we just hardly made a start on it. 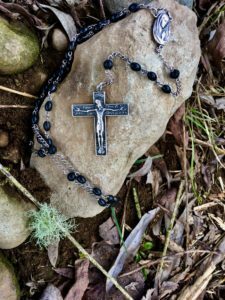 I did get a chance to give here a beginning lesson on praying the rosary. Hopefully that is a jewel that will stay with her. Well, that is sort of the bad news that Rho has had to go. And the good news that I have been waiting to announce is that I have been chosen to go with the Order of Malta on their annual pilgrimage to Lourdes, France. Just got the official phone call yesterday afternoon. This is happening in early May. And the bonus to that is that Padre Tomas the official unofficial padre of Caminoheads will be going with me as my care giver. This is an unbelievable occurrence really. There is some sort of chemistry that will certain take place. Fasten your seatbelt Felipe! Now in this time before the pilgrimage I will be preparing. Lent will help immensely just as it did for me before Spain in 2014. Please pray for me and Phil. Here I am inside on the blog couch and Rho is out doing some laps before breakfast. Seems so odd to change positions. I am always the guy going past the window on the outdoor side. Oh look, I think she is doing another lap. Since I told her that her laps without me would count in the logbook for getting closer to Santiago she has been at it. Yesterday we reached Villatuerta, Spain on Phil’s Camino. 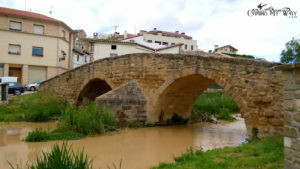 It is approximately 40km west of Pamplona. The pic above has the beautiful bridge over the Rio Ega. All the old bridges were so impressive. How many pilgrims have funneled over them since their building in what year? Oh, there goes Rho and she has Hanna with her. Wow, some kind of movement going on out there. I’m just going to hang tough on the couch. There has been some bad news in the neighborhood. 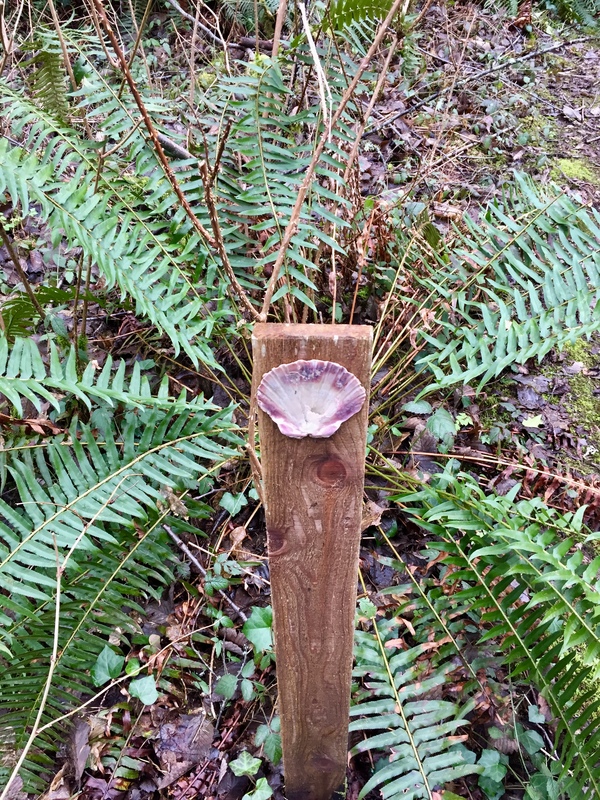 I don’t often talk about the neighborhood here on the South end of Vashon. There is a very talented woodworker down the road here has just gotten injured in his shop. He and his family belong to St. John Vianney Parish. Please pray for Marcus. OK, that’s what it looks like today. Rho is back making her breakfast. Thankful loves, Felipe. A Friday in Lent, The Second Friday. 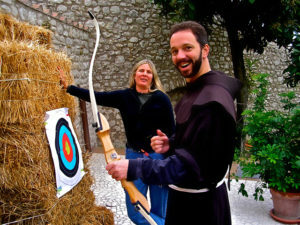 Had a three hour conversation this morning with Rho on things archery and things Camino. Wore me out. It was just supposed to be writing and I fell asleep in the meantime. 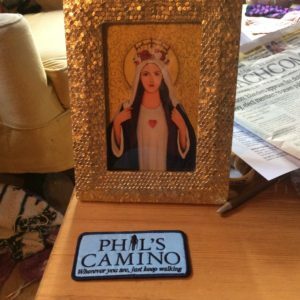 Rho just walked three laps on Phil’s Camino while I was snoring. Glad someone is getting something done around here. 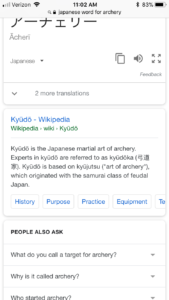 Somehow in all our conversation we were able to connect the archery path with the Camino path. Which was very cool. 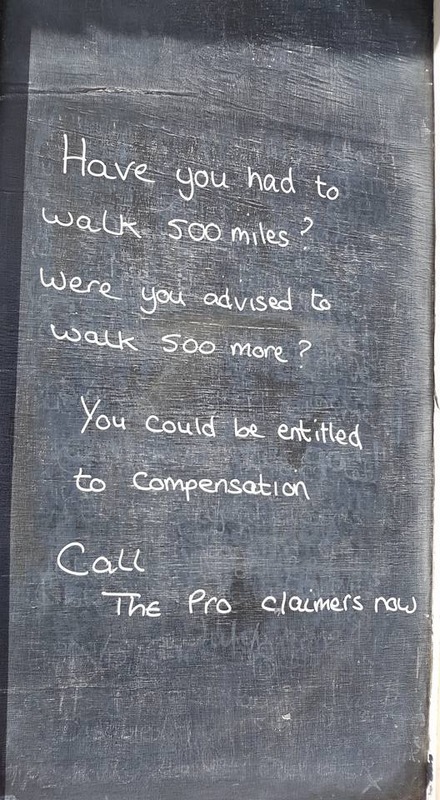 It is maybe a truism maybe the the Camino can be connected to anything somewhere someplace. The connection maybe is history, or inward fortitude, endurance or what not. Don’t have that sorted out. 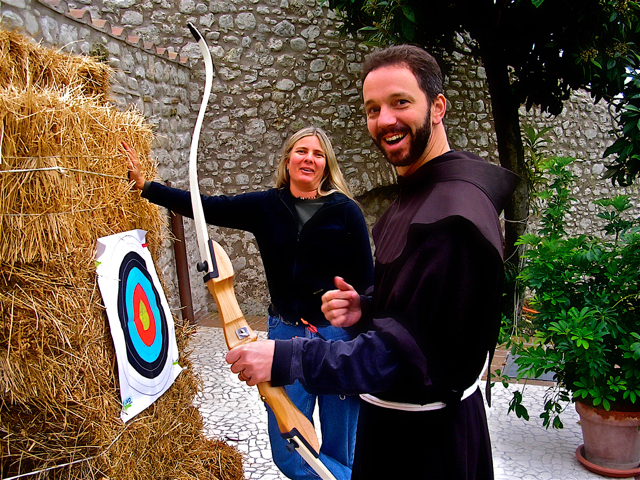 Rho brought archery gear to Italy and here is Friar Rick all excited about shooting. 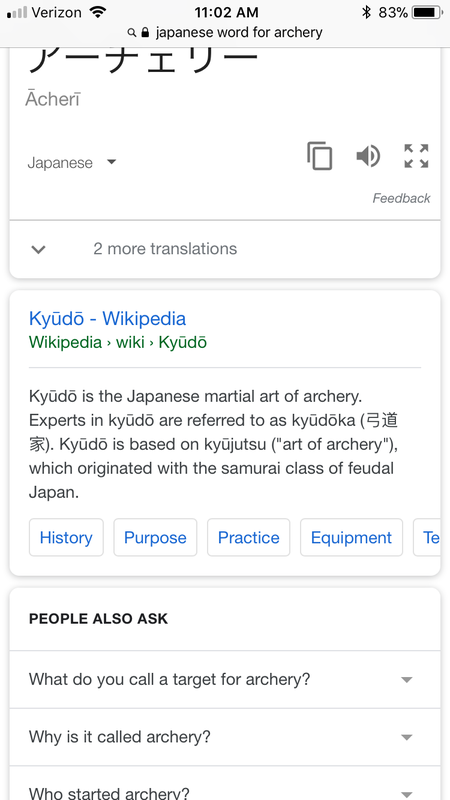 Wikipedia’s take on Japanese archery. Words that have a “do” on the end signify paths. Phil’s Camino mapped on GPS. Well, we have been busy if not slightly disjointed. The sun is out and we are going to shoot some arrows here in a little bit. I need to get my energy together. Here we are, life with Rho, love Felipe. The tapas table in February. Ron from Virginia got that in his fortune cookie recently. “It’s kind of fun to do the impossible.” Yea, a good thought to start out the day. And our day here looks like snow and Rho. 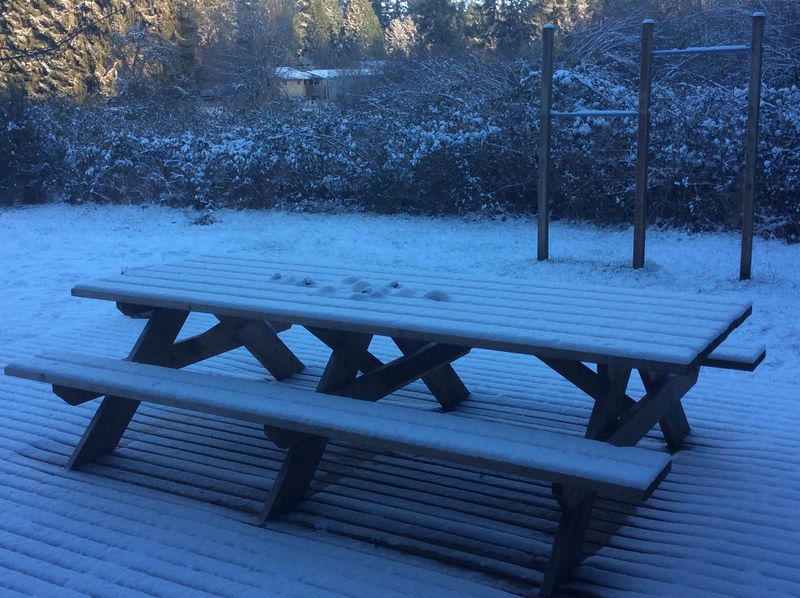 We have this cold streak with the white stuff to go along with it. And in addition our friend from the warm place is visiting, Rho from San Diego. I really enjoyed reading Cris’ post (Our Bureau Chief from Buenos Aries) about what we have figured out here at Caminoheads. It was such a thoughtful and well articulated response: once a pilgrim, forever a pilgrim; fellow pilgrims are a treasure; we are all connected. I am not sure how to add anything more without being repetitive. However, in the spirit of on-going dialogue, I will give it a go. 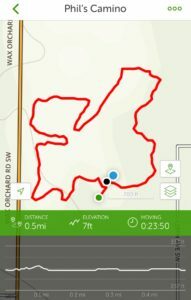 Think of it as another lap around the trail. 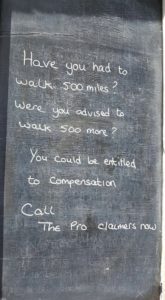 Ever since the Camino it is easier to see everyone I meet, and know as a pilgrim, each carrying their own particular load. This point of view makes it easier to extend grace to people and situations that once before might have annoyed, confused or frightened me. On the Camino it seemed effortless to simply be in the present moment. Here, there are so many distractions, competing engagements, never-ending “to do” lists that pre-occupy my mind. Walking with you reminds me to let all the other stuff go and come fully present. Like the other day when it was so cold and windy and we found that the little corner of field bathed in sunlight and protected from the wind by the hawthorn hedge. That bit of winter warmth was so welcome. We stopped talking and just stood in wonder and grateful silence for what seemed a long time. And then we just started walking again. Be open to miracles, even the tiniest ones. Finally, I am growing ever more aware of the impermanence of things: relationships, situations, material goods, health, vitality – nothing escapes its eventual passing, and creation is on-going. Like the changing of the seasons, good fortune can slip into ruin, and ruin can be dissolved by kindness and suddenly appear as good fortune once again. We all come and we all will go, this state of mind makes every minute more valued. On the Camino we walked with some for a minute, with others for the whole way. I was surprised how important even those momentary companions became to my journey. 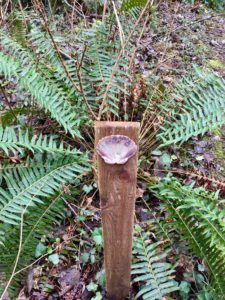 When we walk and tapas here, whether on your trail or through the virtual landscape of this blog, we are moved, changed by the conversations, the comments, the time together. OK that’s my two cents worth. Many blessings Felipe, Cris and all caminoheads everywhere. Yea, we are so rich! I have to go and make some things happen. Love, Felipe. From Lucia, saw it on Face Book. I can’t tell you how happy I am for getting through the night so easily. Last chemo cycle I had a very hard time, the worst that I ever had, but this time I was passed over. So the morning looks more beautiful. We are getting a grip on the side effects of the new chemical treatment and that is very heartening. I want to talk about that soon since I want to thank some folks for helping me. What a great straightforward post! What have we figured out?… That is a great question, and if I speak for myself, being part of this “salon” in the French sense of the word :D, I think for me, it has been a lot. It brought me back to the post I wrote one year after I walked the 2 weeks, back in 2011. But “this conversation” we are having here, deepens day after day, my own humanity. I am learning how to be human, by coming by and read the posts and the comments of my fellow pilgrims. And I am totally honest when saying this. 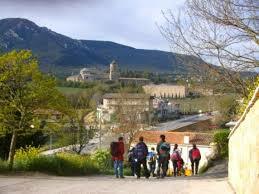 1) “Once you are a Pilgrim, you are forever a Pilgrim”. There are certainly other things that may change as we walk, but if we walk as we learned in the Camino, we may be at times lost, but most likely we will continue to be pilgrims. Being a Pilgrim is a blessed difficult to forget or dismiss. 2) “The fellow pilgrims are a treasure”. You become part of a Family; the “Family of Pilgrims”, because you shared the pilgrimage. And the secret is in the word “share”, and it is difficult to “dismiss” that part of the sharing thing… First you share the path, the albergue, the showers, then you start sharing the food, the “pilgrim’s gadgets” such as the poles, or the guide; after a bit, the conversation, the ear, the words, soon it become the heart and the soul, and prayers, and thoughts, follow too, and I can continue. Fellow pilgrims have shared their homes and families with me, and I have had the fortune to do the same; just as an example that the treasure is not exhausted or confined to the Camino, it rather starts there. 3) “No matter what or how, we are all connected”. I think about you and I: your cancer, the Avastin, my work, Genentech; your admiration and interest in Pope Francis, me being from Argentina; the purpose of my trip to Ireland, and its connection to Catherine and Dana; and we could continue with “facts”. But I think we also figured out that “feelings” and “words” connect us… I am thinking when we talked about “Beauty”, or “Goodness”, or “Presence”… or when we feel we learn from each other… and mainly when we actively feel we CARE for each other. I, myself, figured out quite a few things in this “salon”, this is why I am grateful to you and to all of you, for teaching me and helping me to be more human. Hope I did not miss the point here! Wow, as in wow! I am so grateful for that kind of insight and the work it took to craft that so beautifully. You are so appreciated Cris. Well, time for me to go. My Rebecca is making her world famous mac and cheese tonight for the family. Have to finish up my tax prep. A February day here. Love, Felipe. William on the right, our Canadian Chief, thirty years ago. 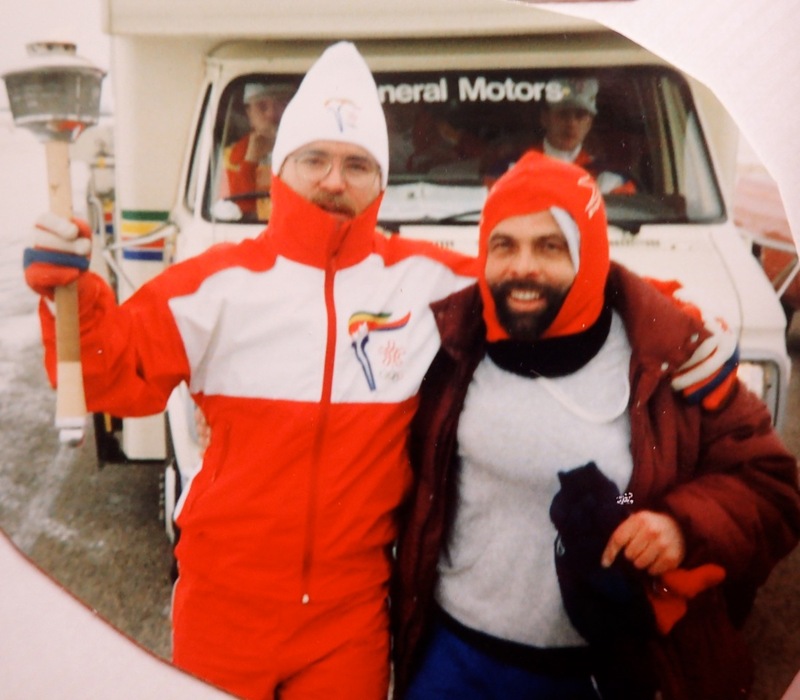 Helping to get the Olympic torch across Canada. Yea, saw that on my Mrs Butterworth’s Thick and Rich Pancake Syrup this morning. I thought, that’s a pretty good idea on a personal level. I think I would just be fine getting through the winter without freezing my behind, thank you. Yup, that’s our big emphasis these days, keeping warm and of course looking for signs of spring. And there are some of those. Crocus, Snowdrops, Indian Plum blooming now, that’s a good start. Starting to snow now, tiny flakes. Also on a personal level it feels like Passover for Filipe. I have entered the time of my chemo cycle when I have had such a hard time in the past and it seems pretty smooth sailing so far. Some changes were made in my cocktail and in my diet and that could be the difference. This is very welcome. Catherine called early this morning to see how I was doing. What a good buddy to have, checking in on my “walk”. I am really leaning on her lately but that is what pilgrims do sometimes. We are supposed to learn how to ask for help and be humble enough to accept it gracefully. Rho, a pilgrim from San Diego, is coming on Thursday. She is very much an archer and will get me out to do some shooting which has been on the back burner for me. Also she has a connection with Italian pilgrimage which will be good to learn about. Well, little bits of news for you today. Thanks for stopping by to the ranch and keeping us company. Alperfect, love, Felipe. Cold here at Raven Ranch. It is about as cold as it ever gets around here. It is supposed to be 19 F overnight. Temps in the twenties seem to be in my memory as the coldest. 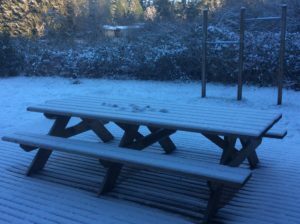 Well, we are feeding the woodstove regularly and watching for frozen pipes. The lights have been flickering in the windier times but haven’t had to start up the generator yet. Rho is here in Tacoma, up from San Diego. She will be out here at the ranch later this week for a number of days. I don’t remember the last time we saw her, it has been a while. So we are scheduled to do some archery together which I am looking forward to. Yesterday we had a nice walk even though we had to cut it short because of the wind and cold. We retreated to the tapas table to talk it over. One couple was new to the walk although I have known the male component, John, for years. So Lin his friend was in from California to brave the locals and the local conditions. I was giving my usually sort of tour guide talk early on in the walk and at some point when Lin and I were together I said, “We have sort of a salon going on here in the French sense of the word. We walk and talk and figure things out.” And she said, “Oh yea, and what have you figured out?” I was gathering my thoughts at that moment and then somehow we got distracted and the thread got lost. But I have been haunted by that simple question since. Yes, what if anything have we figured out in all this effort, expense of shoe leather and empty bottles of wine? I know for one thing that we have figured out enough to perpetuate our togetherness. That could be enough although I am certainly trying for more. It would be nice to have a long list of accomplishments but perhaps we don’t. I will ask around. Here we are on the closing end of the first week of Lent. Are you making progress? Only the best, love, Felipe.